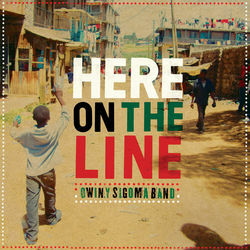 Anglo-Kenyan band Owiny Sigoma are due to release their latest single "Here On The Line" on the 5th December 2011. The single is on Gilles Peterson's Brownswoods Recordings label with a download available too (BWOOOD078D). Penned by guitarist and singer-songwriter Sam Lewis, "Here On The Line" is the second single to be taken from the Owiny Sigoma Band’s critically acclaimed self-titled debut album. In contrast to the hypnotic nyatiti melodies, chattering percussion and propulsive low end that has charmed listeners so far, ‘Here On The Line’ floats gently on a bed of acoustic guitar melded with lilting nyatiti licks, Charles’ meandering drums and Sam’s earnest vocal. It’s a perfect example of the Luo/London soundclash that made this album so unique and hooked in fans such as Nick Grimshaw and Huw Stephens at BBC Radio 1, Cerys Matthews, Huey Morgan and Tom Ravenscroft over at BBC 6Music, Lopa Kothari on BBC Radio 3, as well as XFM’s John Kennedy. It was back in 2009 when a close-knit London-based collective of musicians made up of Jesse Hackett (keys), Louis Hackett (bass), Sam Lewis (guitar), Chris Morphitis (bouzouki/guitar) and Tom Skinner (drums) travelled to Kenya. There they met Joseph Nyamungu, a phenomenal nyatiti player/teacher whose scope of knowledge of traditional Luo music is unparalleled. The initial meeting was a huge success and led to a number of sessions with Joseph and Charles Owoko, a drummer specialising in traditional Luo rhythms. These sessions concluded with time in a downtown Nairobi studio where the sound developed into something unique, fresh and full of verve. The Owiny Sigoma Band made their UK debut one hot, sticky evening back in June. Driven by Joseph Nyamungu’s spellbinding nyatiti hooks and underpinned by the percussive power of Tom Skinner and Charles Owoko, the 7-piece band rattled the window panes and delighted the sell-out crowd at Café Oto in Dalston, London. An unexpected cameo on organs/fx from Gorillaz and Africa Express co-founder Damon Albarn made the evening super-special. Owiny Sigoma Band (live on stage at 11pm) + Sofrito Sound System, surprise guests DJs, MCs, percussionists - and Sofrito Rum Punch. Entry is £10 in advance (+ £1 booking fee), more on the door. Full address info is on the tickets and will be published nearer the time. Tickets are available from Eldica vinyl & Retro (Bradbury Street N16, just behind Dalston Kingsland station), Kristina Records (44 Stoke Newington Road, N17 7XJ), Sounds of the Universe (7 Broadwick Street, W1F ODA), Honest Jons (278 Portobello Road, W10 5TE). It was on the eve of President Obama’s inauguration, on 20 January 2009, and there was an air of jubilation when the close-knit collective of London-based musicians - Jesse Hackett (keys), Louis Hackett (bass), Sam Lewis (guitar), Chris Morphitis (bouzouki/guitar) and Tom Skinner (drums) - first arrived in Nairobi. They were brought to Kenya's capital in order to collaborate with local musicians as part of a project established by Hetty Hughes and Aaron Abraham, co-founders of a voluntary organisation called Art of Protest which aims to promote local Kenyan musicians and rappers. It was a loose arrangement with no specific agenda other than to bring the musicians together, exchange ideas and enjoy the results. Whilst soaking in the ecstatic mood, Art of Protest introduced the London faction to Joseph Nyamungu, a phenomenal player/teacher of the nyatiti (an 8-string plucked lyre played by the Luo people of Western Kenya, typically in Benga music) whose scope of knowledge of the traditional music of the Luo tribe is unparalleled. The initial meeting was a huge success and led to a number of sessions with Joseph and Charles Owoko, a drummer specialising in traditional Luo rhythms. Inititally finding a studio that could accommodate a 7-piece band proved difficult, with most studios in Nairobi catering solely for rap and R'n'B style productions (i.e. a computer and one mic). In the end they managed to hook up a session at a studio in a disused factory in downtown Nairobi that could just about handle the whole band. It was there that the sound developed into something unique, fresh and full of verve - a Nairobi meets London sound clash. The five London-based musicians, who have been friends since their school days, draw on a broad spectrum of African influences, from Fela Kuti and Tony Allen to the likes of Thomas Mapfumo and Oumou Sangare. However, the template for the Owiny Sigoma project was drawn from hitherto undiscovered traditional Luo folk songs reanimated by Joseph, Charles and the boys. "Owiny Sigoma is my grandfather," explains Joseph. "He died a long time ago and I decided to name the school after him. The songs are based on Luo folk songs and are all written by me. I usually walk while singing and composing a song, or just dream them." "What I heard when I first played Owiny Sigoma Band on the radio was a phat, wayward dance record with African leanings and it just felt completely right," explains Gilles Peterson. "That’s why it was good to continue along the path that they’d followed, because they've got a different approach to how the drums should sound and the bass should sound – it’s like they’ve been listening to a bunch of Arthur Russell and Liquid Liquid records. Those characteristics alongside the nyatiti, the vocals and the cow’s horn, lend it these unique properties that you don’t hear in any other African music and make it exciting. But, fundamentally, the reason that it works for me (and Brownswood Recordings) is that it’s drum and bass heavy … rhythmically heavy." On reconvening with Joseph and Charles a second trip to Nairobi in May 2010, the group had now grown to a 10-piece big band, with Joseph inviting many other musicians to join the proceedings. What followed was a two-day session at the Kenya National Theatre culminating in the forthcoming self-titled album – a collection of gloriously loose Afro grooves symbolic of the true culture clash between the Luo and London. With the hypnotic melodies of the nyatiti taking centre stage, the joy of these recordings is in the sensitivity of the rhythm section, which swings and chatters, gently but firmly propelling these jams from guaranteed shoulder lean to certified hip-swinging. The founder of Gorillaz and Afrika Express, Damon Albarn, even gives the project his personal blessing, popping up on organ duties on the sprightly "Odero Lwar" and "Margaret Okudo (Dub)". Joseph Nyamungu takes care of lead vocals throughout as the traditional folk songs of the Luo predominate, with Jesse and Sam taking over for the London-leaning "Wires" and "Here On The Line" respectively. Also available now is a monstrous Theo Parrish remix of "Wires" (download) on which the Motor City legend strips back the melodic content to the bare essentials and constructs one of his trademark twisted trips around that nagging bassline and insistent four-to-the-floor kicks, as well as the "Tafsiri Sound" EP (12" 180 gsm vinyl + download) which included Quantic remixes of "Doyoi Nyajo Nam". A new single, "Here On The Line", is due for relase on 5 December. "Full of joyously constructed experiments". Extra! Extra!